Michael Gove, when Secretary of State for Education, would use PISA results (but only some) as a justification for continued reform. For example: “Since the 1990s our performance in these league tables has been at best, stagnant, at worst declining. In the latest results [he’s talking about PISA 2012 here] we are 21st amongst 65 participants in the world for science, 23rd for reading and 26th for mathematics” (Speech). So, Gove saw 21, 23 and 26 out of 65 – that is, the UK as roughly a third of the way down the “league table” – as bad results, bad results that deserved a speech in parliament, policy reform, changes to national assessment and more. 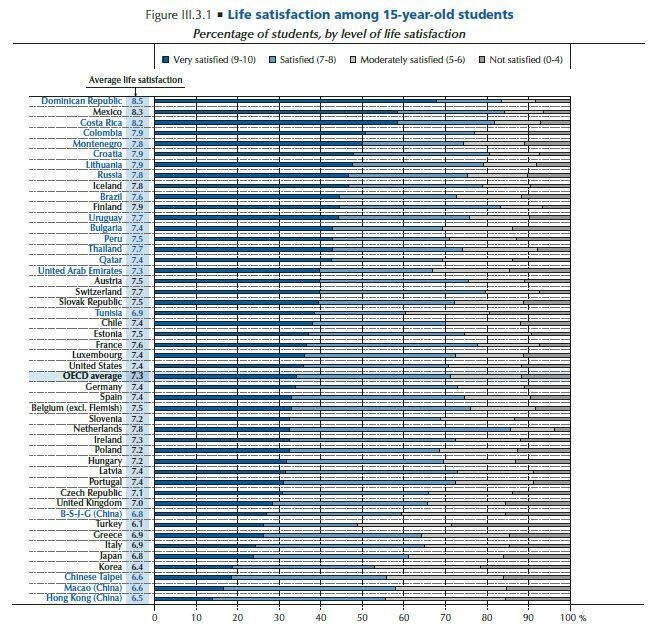 This week, PISA’s life satisfaction score for 15-year-olds places the UK as 38th out of 47. A one off, perhaps. Except that UNICEF (2013) placed the UK’s child well-being as 16th out of 29. UNICEF (2007) had UK child well-being as last of 21 rich countries. No ministerial announcement this week. School buildings have many jobs but asking them to contribute to student well-being (if this is indeed something they can do) does not seem unreasonable. To the extent that comparing one country with others is a valid means of deciding what’s good and bad with an education system, we in the UK have problems of student well-being that are far more serious than anything to do with students’ academic abilities. Could last year’s report by RIBA (the Royal Institute of British Architects) Better Spaces for Learning: #TopMarkSchools (PDF, 3MB) be followed by another, that conceives in the first instance of schools as simply better spaces to be? It could then move towards specific functions such as learning, teaching, safety, social environments etc all of which are unlikely to be causally independent of well-being itself. None of this would provide a simple patch for the problems that the UK has with both its education provision and the happiness of its young people but it might help to rethink what the added-value of architectural design is: whether incremental learning gains, happier people (or both). There are two further problems worth discussing here and both relate to the way in which the UK government, “Seeing Like PISA” as Gorur puts it, causes harm. Firstly, although much is claimed for 21st century skills and the need for UK students to keep up with those from high performing economic neighbours, what actually happens is: “Narrow testing regimes, reliant on coaching and practice to produce higher and higher grades, which actually signify less and less in terms of educational achievement, are unlikely to produce flexible and creative individuals over the longer term” (Torrance, 2017:93). The claimed purpose of education reform is defeated by the means employed to achieve it. Secondly, the OECD report states that “Teachers can play a particularly important role in creating the conditions for students’ well-being at school” (2017:40). Yes and no. They probably could and it’s likely that many do but there are two problems with this line of argument. First, teachers are now morally encouraged to treat the symptoms (student anxiety) of a dysfunctional system rather than the cause (the high stakes exam system in the UK and England in particular). Second, we know from the OECD’s own work that England’s teachers work an incredible amount. (Almost 20% more hours per week than the average of 36 participating jurisdictions in the OECD’s 2013 Teaching and Learning International Survey (TALIS)). Only teachers in Alberta and Japan work more (Sellen, 2016:7). Why do teachers in England work so much? This is where the circle closes and the irony is most visible since Sellen concludes that: “it is plausible that a ‘high-stakes’ approach to raising performance has created a long-hours culture in a highly competitive school system” (ibid:51).